There is plenty of parking available on both side of the V-Market building. Chef Michael Chiarello has returned to his culinary roots by creating seasonal farm-to-table Italian cuisine reflecting the bold flavors of Chiarello’s heritage in his signature style 1st made famous at Tra Vigne in the 90’s. An award winning chef/vintner & Food Network host, Chiarello celebrates his Italian roots and the Napa Valley with a menu echoing his long practice of using the finest locally/sustainably produced food. 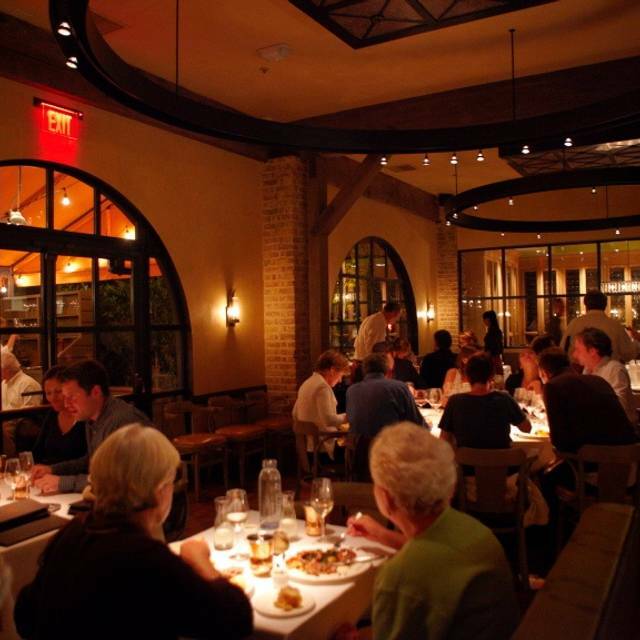 Located in Yountville, in the heart of the Napa Valley, Bottega’s extensive wine list represents hard-to-find favorites of the Valley and interesting Italian selections. Chiarello restored the integrity of an old 1800’s estate by uncovering beautiful hard wood floors, timber beams, old brick walls and windows. The inviting dining room is accented with reclaimed antiques, warm fabrics and eclectic light fixtures lending to the restaurant’s old world comfort. 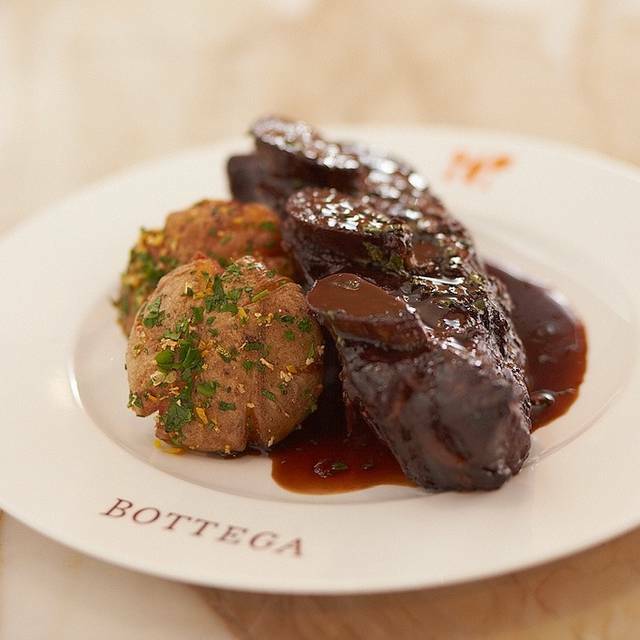 We have always enjoyed Bottega, particularly for lunch. The menu hasn't changed much in recent years, but the quality is consistent. The servers are friendly and attentive. Patio seating is always preferred as the inside is much noisier and more rushed, but we never feel rushed through our meal. It's a lovely way to experience good food and wine in a destination restaurant. A very nice setting and an interesting menu with some dishes presented with certain elegance. While the quality of the food is excellent, prices are higher than expected. Loved it. 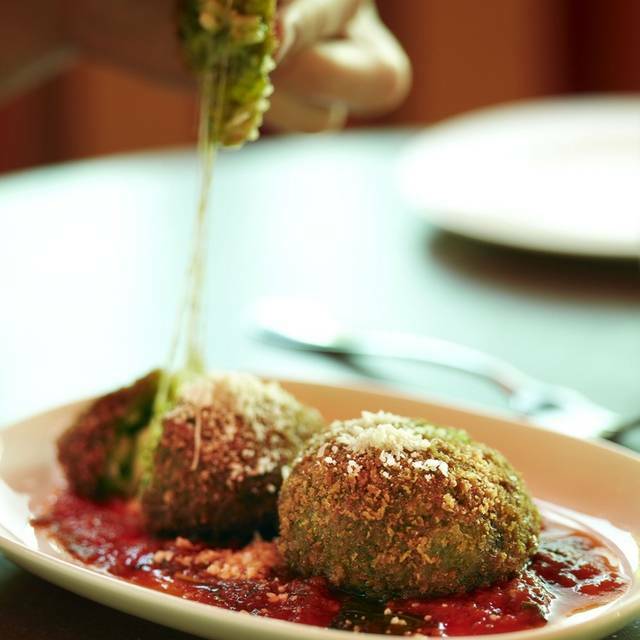 Delicious Italian food even my Nonna would appreciate. Will definitely be back! We love the place, food, ambiance and the service!!! $35.00 per bottle corking fee, too high as most high quality restaurants we’ve dined and brought charge between $10.00 to $20.00 per bottle. Food was good, not best Italian in the area as marketed. Used to be better. Mediocre dishes and slow service. Favorite spot when up in Napa. The food is amazing. Sitting on the patio outside on one of the first warm days of the year. Great way to spend my birthday!! Visited the shops in the area and stopped by for lunch at Bottega. It was just marvelous. I had a grilled octopus appetizer and the risotto both excellent, I could of eaten octopus all day! I had a gelato as well and it was a great ending to the meal. Service was first class! It’s our anniversary but they made it wrong to a birthday. But overall is pretty good. Excellent way to spend our anniversary. Love this place! The food and the service are really extraordinary. Like a lot of older people, I would like it to be a quieter, but overall Bottega is just wonderful! AMAZING!!! Exceptional wine list and menu. Always a treat. Even though we had a reservation, chose to sit at the high top in the bar area. Bartender who waited on us was excellent: prompt, attentive, and friendly......all the while taking care of all the bar patrons. Appetizer recommendations were great, main course was out of sight, wine selection spot on. 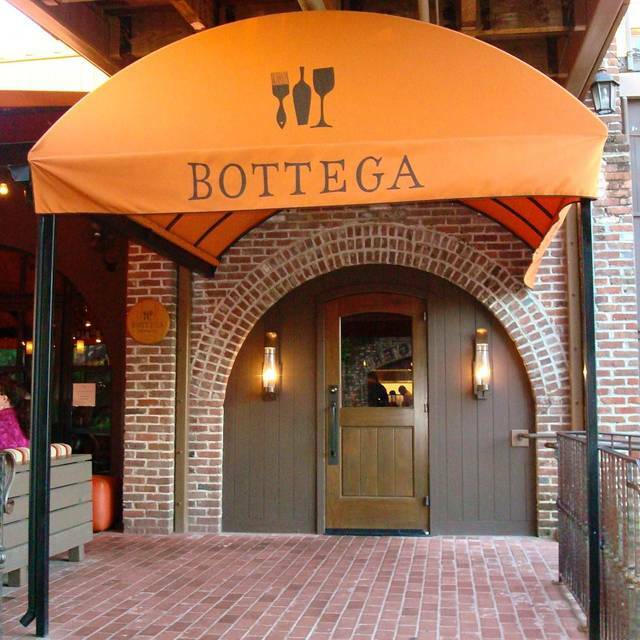 We went to Bottega for lunch on my birthday! Our waiter was excellent! His suggestions were spot on! 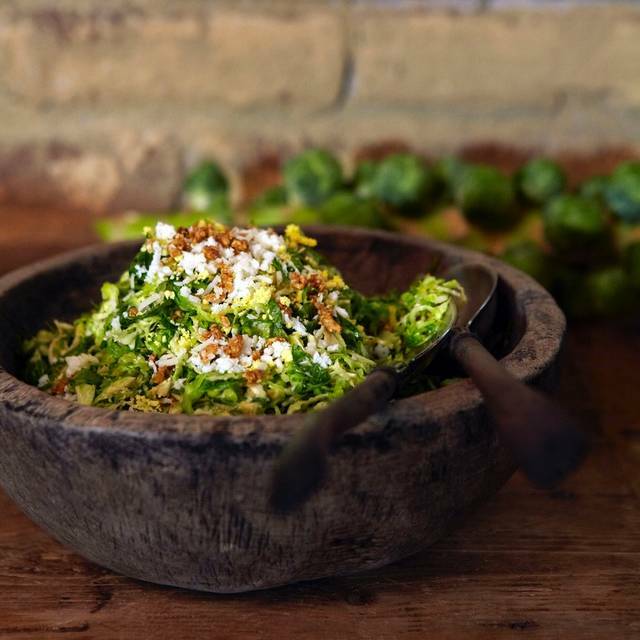 From the wine, to the octopus appetizer, the Brussels sprout salad and squid ink pasta! It was our best experience in Yountville out of the 6 restaurants we tried. Pretty popular restaurant located in Yountville. 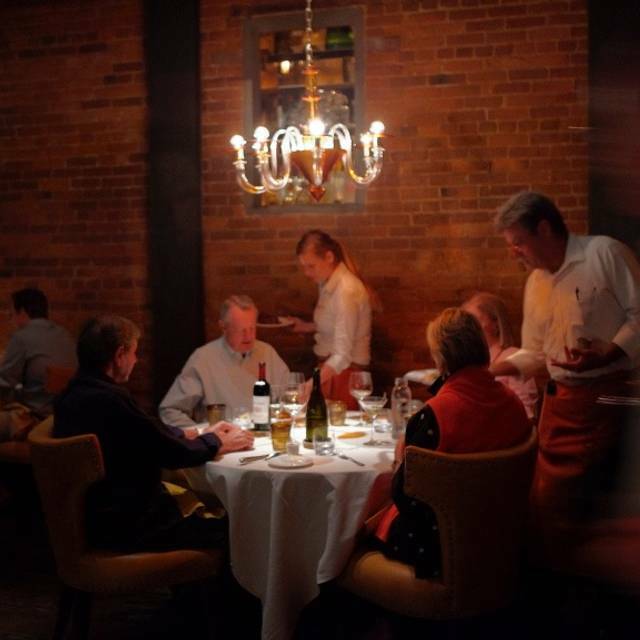 Expect a crowd during the weekend evenings so reservations are recommended. Food portions aren’t overly excessive and are perfect for one person with a majority of the plate prices ranging between $17-$45. 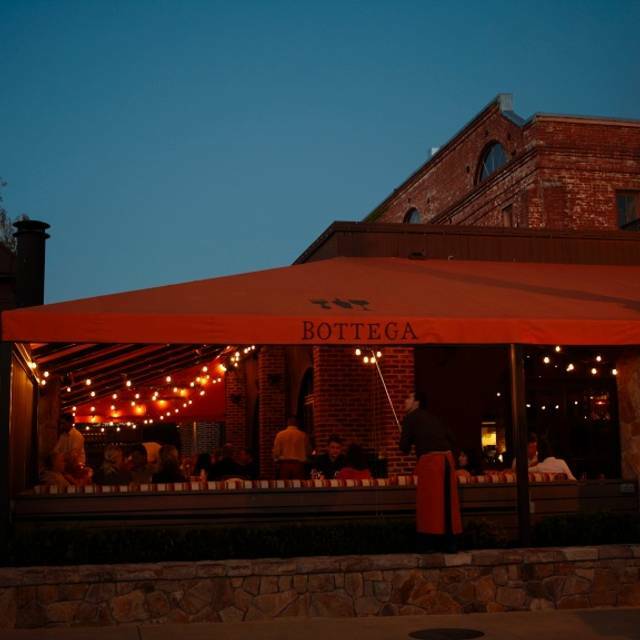 Bottega is one of our favorite Napa restaurants. The dishes are inventive, delicious, and artfully plated. The service is excellent, with professional and friendly staff who want you to have a superior dining experience. The outdoor patio is a lovely place to sit with friends, enjoy a sumptuous feast, and people-watch. The bar is a great place to grab a drink and a meal. This is the one restaurant we take all our out-of-town guests when we want to impress them. Although the food was very good, the seating was abysmal. They've jammed three tables for two into a space that would ideally contain just two tables in the front banquettes. This means that if you are unfortunate enough to be seated at the middle table - between two corner tables - you can barely squeeze in, and you are now dining in very close proximity with the two tables on either side of you. When we asked to be seated instead on the large, extensive + enclosed patio (which was virtually empty) we were told that only two tables could be seated outside-both of these had parties of 6. There are plenty of heat lamps on the patio, and it appears to be a very conscious decision on the part of the management to cram diners inside together to the point of making the meal experience very uncomfortable. My suggestion would be to review your banquette seating design and to utilize the lovely exterior patio space more so that diners would be comfortable, and want to return. We will not return unless we can be guaranteed comfortable, exterior seating with some comfortable space between us and our fellow diners. Everything was great. Highly recommend. Beautiful restaurant with fantastic service and a lovely selection of unique Italian dishes! Food always hits the spot here. It can be pricey depending what you order, but it's guaranteed delicious. I always have to get the Polenta Under Glass. 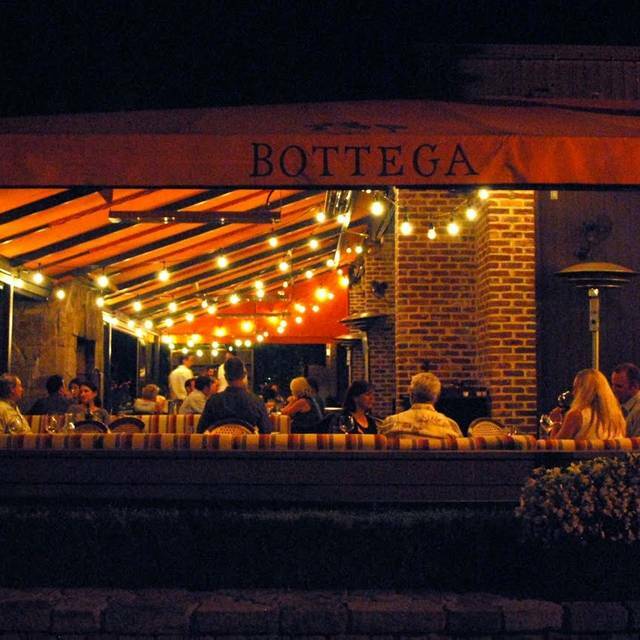 Bottega was a great experience for us! We had wonderful service and good guidance choosing a great bottle of wine from the sommelier. Food was uniquely prepared and delicious! We enjoyed the options and thought the price point was very reasonable. The restaurant was busy on the night we visited, but we never felt rushed to order and enjoyed the buzz of this well-loved restaurant. I don't care what he's done in the past. His restaurant is awesome! Great food, great service. La comida está espectacular! Gran servicio . Fantastic food. Very memorable dining experience! 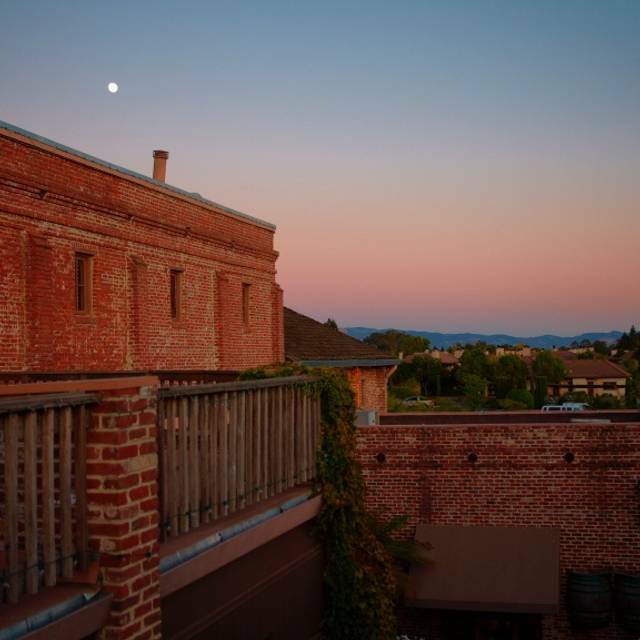 We have dined here many times before and always put it at the top of our list when making a visit to wine country. We were very disappointed overall and here is why: for a not that busy Tuesday night service was horrible. We were also celebrating a special anniversary which made it even worse. After our appetizers, we had a one hour wait for our main course. We were patient and happy to be there so just kept on waiting. When our main course arrived with a side of cauliflower we bit into it and it was so over salted we both almost gagged. I have to say that I do like salt but this was truly inedible. Okay, we said, we will eat our main course as by now we are very hungry. As we begin we realize that this is not what we ordered at all! When I mentioned it to the waiter he was not all that apologetic...just said well, I thought that this is what you ordered. No. By then it was so very late and we were so over our bad anniversary experience that we did not want to try another course. I am someone who has all of Chef Michael Chiarello's cookbooks, and I cook from them and we have been there when he is there and the food has been much better and the experience amazing. I would say that the shine has worn off of Bottega and that this restaurant either had a very bad night or no longer is worth prioritizing as a Napa Valley dining experience. So sad. My wife and I have been here a few times. The food was amazing as always but the service was lacking. Which brought a damper on the entire evening. Check your bill at the end because we had a table of 5 and when the server split the check three ways the bill didn’t add up right on all three bills. There was a auto gratuity that was about 25% on each of our bills. When we added up our bills they still were off by a few dollars. When my wife asked the manager he said we are charged for bread and water $1 per person but we were all charged $5 per check which was nowhere on the bill. CHECK THE MATH ON YOUR BILL BEFORE YOU PAY & ARGUE IT IF IT DOESN’T ADD UP!! !